Mixed-use development effectively blends various development practices into a format that maximizes land use. Typical in urban settings, developers, planners and end users have long recognized the benefits of mixed-use practices and have attempted to apply these basic principles to suburban areas to prevent proliferation of urban sprawl. The result of mixed-use planning has been the creation of more sustainable, pedestrian-friendly environments combining residential, retail and commercial uses. 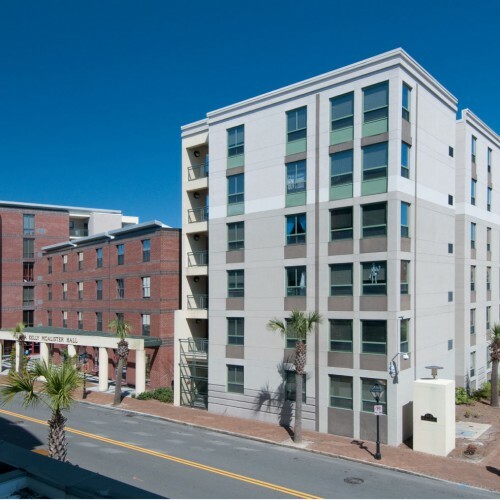 McAlister Development Company has successfully blended student housing with commercial and retail uses in downtown Charleston. Student residents in dormitory and student apartments live above ground floor retail and dining options, and conveniently adjacent to structured parking to create a fully- integrated student lifestyle. Moreover, because so many daily needs are located nearby, students are afforded the opportunity to live a full-service, everyday life without the need for extensive mobility. Anthony McAlister formed McAlister Development Company in 1990 with the purchase of a modest, 4- unit building in downtown Charleston in close proximity to the College of Charleston. During his days as a student at the College, Mr. McAlister began to understand and appreciate the need for quality student housing opportunities. In addition, there was a continuing friction between local residents and College of Charleston students, as neighborhood houses and apartments acted as dorms for students with nowhere else to turn. With the success of the small quadplex secured, Mr. McAlister initiated a plan to broaden the student housing options for students at the College of Charleston. Despite the challenges of a poor economy, a skeptical neighborhood, and protective City policies, Mr. McAlister pursued a broader agenda of curing the student housing issues in Charleston. Since then, the student housing efforts have helped to concentrate the boundaries of the College of Charleston’s footprint and positively impact the surrounding neighborhoods throughout downtown Charleston. Students now live in a more cohesive student environment, closer to campus in well-built and maintained residential units. Through the development and construction of The Kelly House, McAlister Hall, George Street Apartments, Liberty Street Residence Hall, and Campus Center Apartments, McAlister Development Company has developed over 1,450,000 square feet of vertical construction related to student housing with nearly 1,823 student beds, along with over 1,065 associated structured parking spaces. As Charleston is one of the most historic and picturesque cities in the country, great time and attention has been taken to ensure that the projects developed by McAlister Development Company will stand the test of time by aging gracefully, along with the rest of town. The vast majority of McAlister Development Company’s commercial development projects have been in the form of its Mixed Use development and public- private undertakings. These projects range from various retail projects to public parking decks. 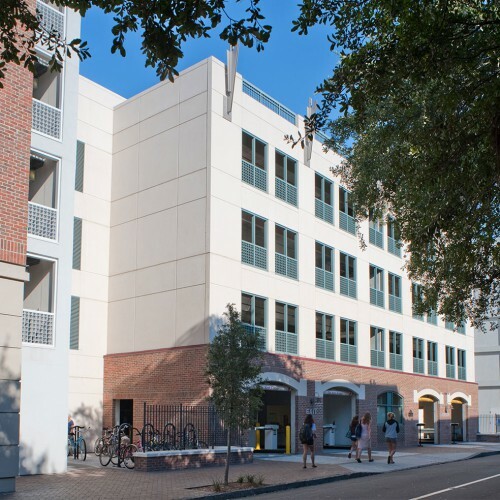 As parking is a limited commodity in downtown Charleston, demand for vertical structured parking has provided a welcomed and obvious choice for development. These parking projects include independent, free standing parking structures as well as public parking blended with residential, retail and commercial uses. A critical component of a parking project is to design an aesthetically pleasing structure. Creating a functional and demanded structure without compromising architectural design that blends into the historical fabric of downtown Charleston has offered some of the most exciting challenges to the team at McAlister Development Company. The company goes to great lengths to build a finished product that blends with the existing architecture and streetscape. As Charleston McAlister Development Company has developed residential uses in all forms from single family homes, townhouses, condominiums, and student housing dormitory and apartment style residences. Project locations range from our hometown area and to the Caribbean. The luxury condominiums developed and constructed on Kiawah Island mark the first multi-family project on Kiawah Island in almost 20 years. The large residential condominiums were developed for discriminating buyers with high quality taste who desired a “lock and leave” approach to island living. The units at The Maritime at Kiawah Island are exclusive to the island, limited in number, spacious in size and uniquely private in nature. Similarly, The West Bay Club in the Turks & Caicos islands captures the relaxing island feel with the chic ambiance of the luxurious travel destination. The West Bay Club functions simultaneously as a fine collection of residences and second homes as well as a full service resort for island visitors. Located in Providenciales along the white sands of Grace Bay, The West Bay Club was designed to be enjoyed by local residents and guests equally, with an array of amenities and luxuries.